Incredibly rare and much sought after original 1987 UK quad film poster for Sam Raimi’s Evil Dead sequel…“Evil Dead II” (Dead By Dawn). The sequel, made six years later and technically a retcon sequel, was allotted a significantly larger budget than the first and is more of a black comedy than the original. Lead actor Bruce Campbell is put through a continually escalating series of horrific encounters that allow him to show the full extent of his talent for slapstick comedy. Palace Pictures bought the rights to distribute the second film and once again commissioned Graham Humphreys to design the quad and video artwork for it after his iconic design for the first film had proved so successful. 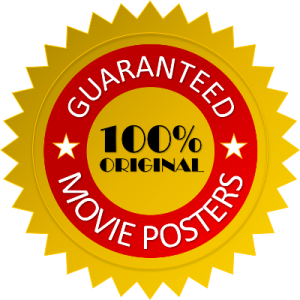 Released in cinemas and on VHS almost simultaneously the modest outlay for the rights to distribute the film proved to be an excellent deal as it went on to see great box-office takings and thousands of tapes sold, but also resulted in making these theatrical posters a real rarity. Totally unrestored this originally folded (as issued) British UK quad film poster is from first year of release, 1987 that displays & presents to excellent effect and is a real find in such high grade condition. A great looking piece of horror art that represents an exciting and scarce country unique British piece of original horror film movie memorabilia. For Eddie Shannon’s superb & informative interview with the artist Graham Humphreys click here. “The Exorcist“ made you feel respect and fear to the Devil. Sam Raimi‘s “Evil Dead II“ makes fun of the Devil and demon possession. Although there are some really scary scenes, there are some really twisted funny situations that would leave you wondering “what the f*** just happened ?”. The movie is funny for the wrong reasons. I eventually don’t laugh about when a man is breaking himself dishes on the head. I don’t think it’s funny when a man is repeatedly beaten up by grotesque characters. I would never imagine a man getting eaten by a demon locked under a cellar and throwing gallons of blood ! 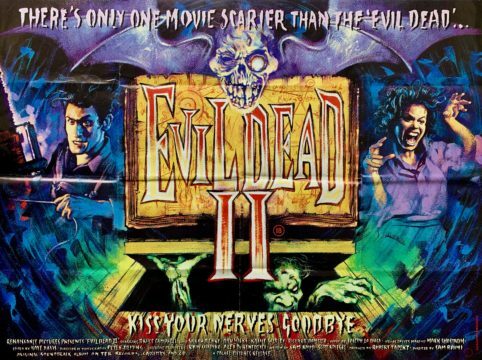 “Evil Dead II“ makes it look hilarious in a wicked kind of way. For example, when Linda’s (Denise Bixler) head tells Ash (Bruce Campbell) that “she is being tormented, and suffering in hell; you can feel a little scared but the next scene has a corpse without a head holding a chainsaw. There’s no time for logic here, just sit and enjoy.